CIT has designed its courses in a very flexible way in order to give you the option of graduating at different levels - bachelor degree, honours bachelor degree, professional and postgraduate. 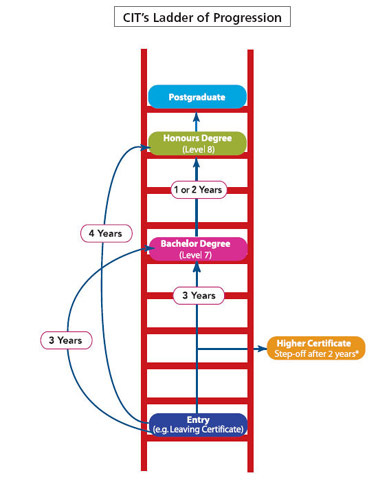 This "Ladder" enables you to progress through the system to qualifications appropriate to your personal requirements. CIT offers "ab-initio" honours degrees. (Ab-initio means "from the beginning"). Students commit to the full four year programme from the start. These are shown in the CAO Level 8 list. Many of our three-year bachelor degree programmes also have an "exit option" after two years; Students who successfully complete Year 2 of these programmes and who do not wish to progress to the third year will receive a Higher Certificate award. There are 30 honours degree courses at CIT. Most of these can be accessed from the bachelor degree level. Progression from a bachelor degree to an add-on honours degree normally requires a 50% average in the bachelor degree examination. However in order to transfer into one of the ab-initio honours degree courses, other requirements may apply. The above is a general summary. Further details are contained in the sections on the individual courses.